Gauntlet is a game mode in The Elder Scrolls Legends, and consists of tournament-style events that you enter with a pre-constructed deck of your own that you will use for the duration of the event. Gauntlets are announced by the developers and can be held several times each month, but are only available during the weekend. Many gauntlets have special rules that apply to all players in the event. The card pack prizes are usually from the latest expansion. 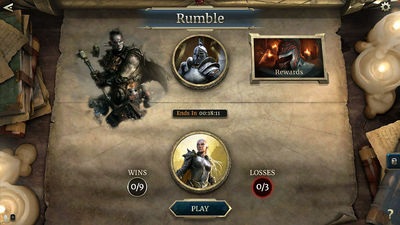 In Rumble Gauntlet, you play until you reach either nine wins or three losses. Entry costs either 150 gold or an Event Ticket. The first Rumble Gauntlet ran for the weekend of June 10-12, 2017. Epic Rumble Gauntlet adds leaderboards for multiple Rumble Gauntlet runs. The entry cost for each Rumble Gauntlet run is still the same at 150 gold or 1 Event Ticket. Your first three runs are counted toward a leaderboard score, and the top 128 players receive additional prizes. Your leaderboard ranking is determined by your win rate and the win rates of your opponents. The first Epic Rumble Gauntlet occurred on the weekend of June 24-26, 2017. 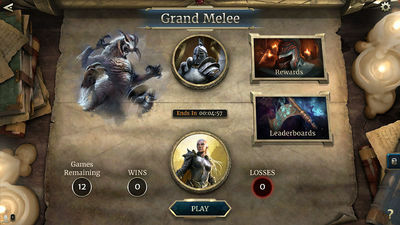 In Grand Melee, you play for 12 rounds, and your prizes and your leaderboard ranking is determined by your win rate and the win rates of your opponents. Entry costs either 1000 gold or 6 Event Tickets. The winners' decks are published to the Legends website. Special Rumbles are similar to Epic Rumble Gauntlets where your first three or four runs are counted toward a leaderboard score, but there is only a maximum of 7 wins per run. The cost of entry for each Special Rumbles is 150 gold or 1 Event Ticket. The prices from the amount of wins are a bit different and the top 2000 players on the leaderboard receive additional prizes. Your leaderboard ranking is determined by your win rate and the win rates of your opponents. Fields of Battle May 12-14, 2018 You and your opponent select one of four different lanes. One will be randomly assigned to the field lane and the other will be in addition to the shadow lane. After you summon a creature here with 4 or more power, draw a card. While you have a creature here, actions cost 1 less. After you summon a creature here, reduce the cost of a random card in your hand by 1. Could use images of other Gauntlets.